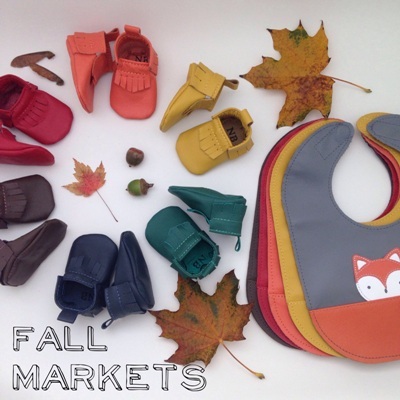 Mally Designs Fall Markets and Retail Shows Announced! Wow, we had an amazing summer, both as a family and as a business! While I am sad to see it go as I write this on the first day of Autumn Equinox, I am also excited. There's something special about fall, and I always feel inspired to go shopping for new boots, sweaters and scarves and I crave cozying up with a cup of tea after a long walk stepping on crunching leaves. The air is crisp and at this moment the sun is shining, and creative ideas are flowing. Maybe it's ingrained in us from the time we were kids, but it's also a time for new beginnings and fresh starts. All of this makes it easier to say 'see you next year' to summer. For us, it also means we are on the verge of our busy season. We look forward to it every year, and this year is no different! A few weeks ago, we started production in our home studio for all of the amazing shows and markets that we do, and we will continue producing our handmade items until it's time to start travelling. For complete details including locations and hours, please visit our events page here. That's 30 days of market selling upon us, all while our online shop is doing 2-3 times the business we do other months of the year. It's part of the challenge that goes along with having such a gifty product - and we absolutely love it! We can't wait to see all of our amazing regular customers, and many new ones this year. I don't know how many more years we will be doing all these wonderful holiday shows, but for now, we love it. Be sure to follow us on Facebook and Instagram for the chance to win tickets to these various shows! Also, now is a great time to subscribe to Mally Mail for reminders and promotions - just head to the Mally Designs homepage for that. We hope to see you at one or more of our fall markets! Meet Sydney. She was an absolute happy little bean and she was pegged as Tai's girlfriend right away at our studio shoot. I really don't think she ever cried and as far as I'm concerned, she was the perfect child! Sydney modeled our Strawberry Bib, which has since been discontinued but can still be ordered through our custom bib studio, as well as our Mod Girl Bib, which she modeled along with her boyfriend Tai, who modeled the Mod Boy Bib. Sydney also modeled our Owl Bib, which continues to be a great selling design for us! Photos Credit: Jason of Revival Arts. Sydney is a talented artist and gifted debator. At 7 years old I am quite certain she will be either a defence lawyer or judge as she has a natural ability to make you think you are guilty or wrong. As in her model shoot with mally bibs, Sydney is not easily amused by jangling keys or cutesy faces, but rather studies your behaviour and stores that information for later. She's not easy to amuse. She is a strong, stubborn, pragmatic fierce girl who has no problem facing the world. She has just informed me she would like creative control over this post so nothing embarrassing is posted about her. I'm a lucky mama. Meet Jacob. He was part of our 2011 photo shoot with Bopomo, which at the time had a location in Morgan Crossing in South Surrey. He was so cute and his Mom was a sweetheart too, who has since become quite a regular customer at mallydesigns.com - thank you Shanna! I think he was a little skeptical of us as we danced around to make him smile, but he modeled like a little pro! 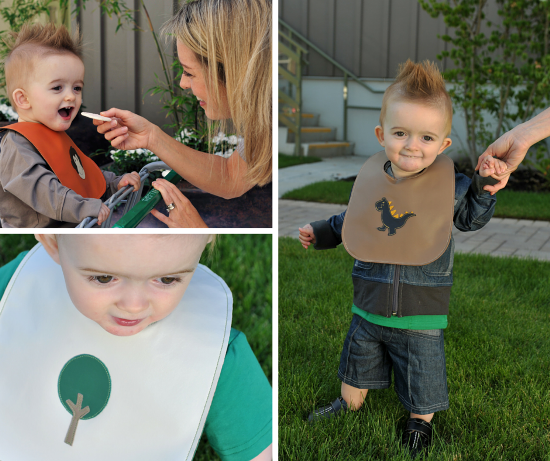 Jacob modeled our T-Rex Bib which has since had a refresh, our Monkey Bib which now has since become a pocket peeker, and our Tree Bib which has been discontinued and can only be ordered through our custom bib studio. He was also lucky enought to get to wear some Peekaboo Beans duds during the shoot, which he got to keep! 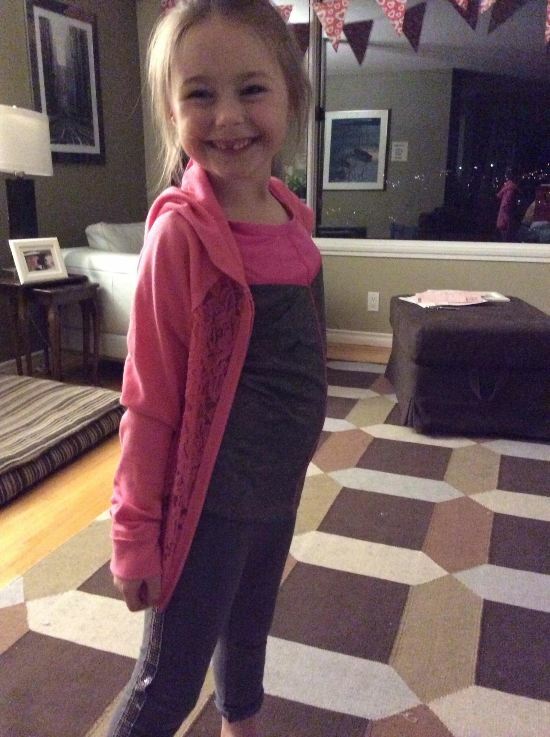 Meet Jacob's little sister Emma, who modeled for us in 2013 at Mill Lake Park in Abbotsford. Like Jacob, she was a little unsure of us. Ashley Martens took our photos that summer, and she managed to get some smiles and excitement out of this shy little sweetie. 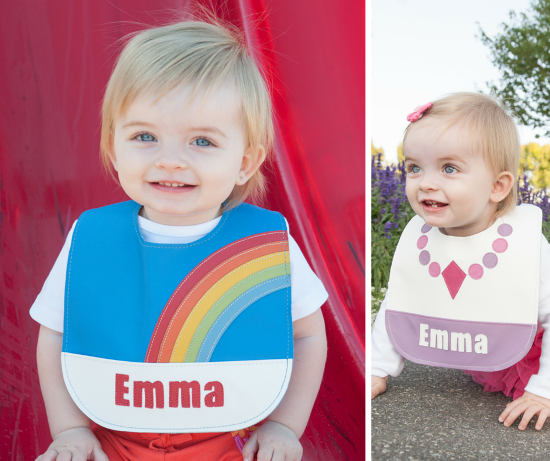 Emma modeled our Rainbow Bib and Necklace Bib, which have both become top selling designs. She also got a sweet hair clip from Baby Wisp. Thanks to Emma for making them look extra cute! Jacob is now 5 years old and is in Kindergarten. He plays t-ball and is in swimming lessons and his favourite sport is hockey. Emma is now 3 years old. 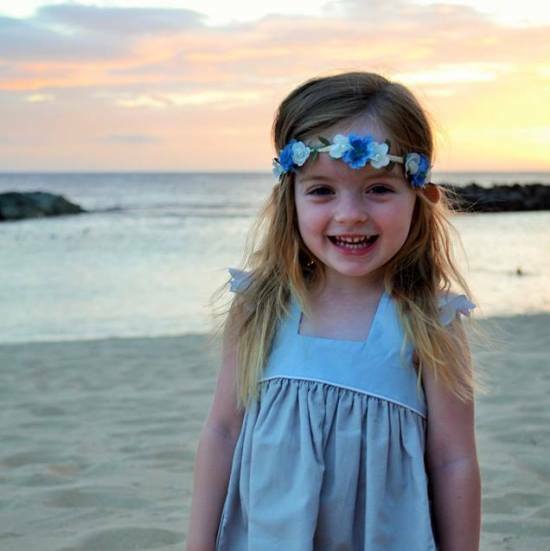 She is in dance, gymnastics and swimming lessons and will be going to preschool in September. Meet Mykah. 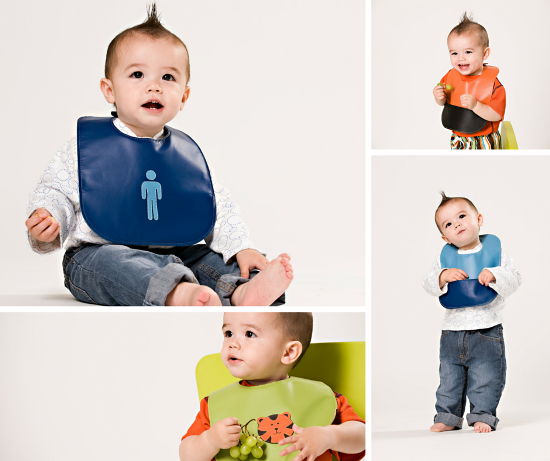 He was one of our baby bib models back in 2010 when he was just old enough to sit up. He was the happiest little guy and I just remember how he already seemed so excited about life at such a young age! 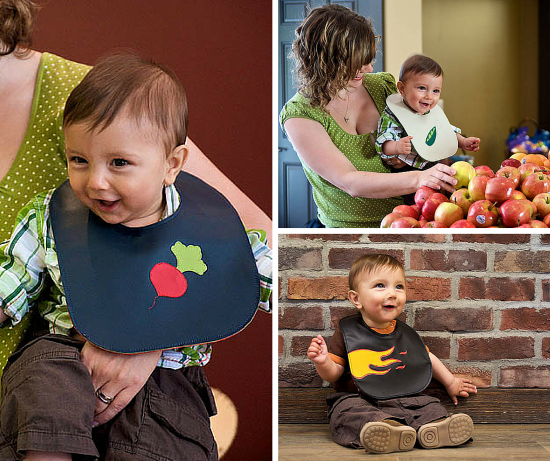 Mykah modeled our Sweet Pea bib while being held by his beautiful Mom Kathleen at a local fruit and veggie market. He also modeled our Flames and Radish bib, which have since been discontinued, but can still be ordered through our custom bib studio. 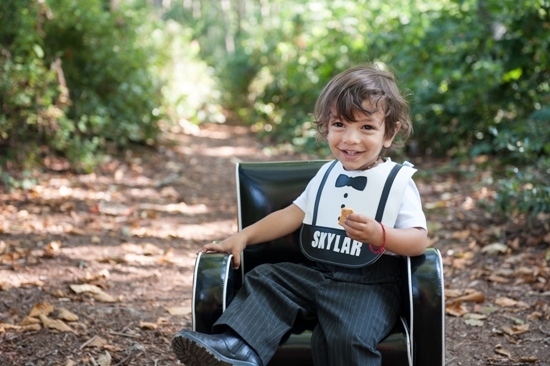 Meet Mykah's little brother Skylar, who modeled some of our toddler bibs when he just turned 2 years old. Who knew that he would be modeling what would become one of our most popular bib designs in 10 years?! I'm not sure yet if it's because the bib itself is so cute, or if it's the model that made it so popular. I'm talking about the Bow Tie Bib pictured below, which we personalized for him. 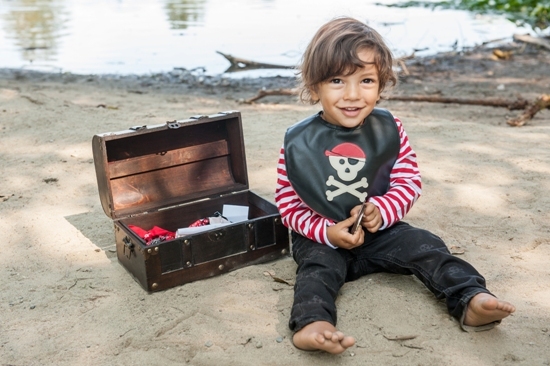 Skylar also modeled our Pirate Bib, another popular design! Mykah is now 6.5 years old - 6 years since this photos shoot for Mally bibs exactly!! 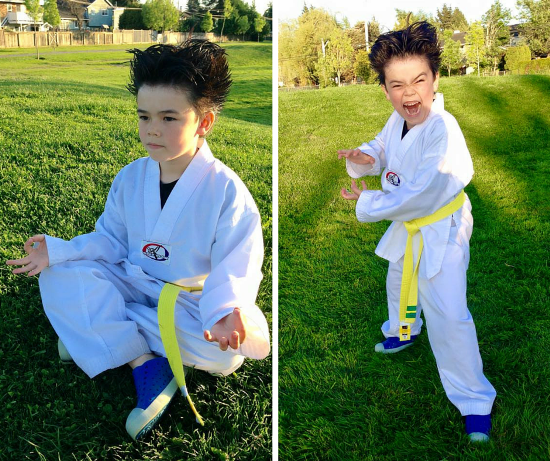 He is in grade 1, loves swimming, karate, his little brother, spiderman and lego. Skylar is a crazy silly little monkey boy that's full of energy and loves dancing, swimming and dressing up as batman. 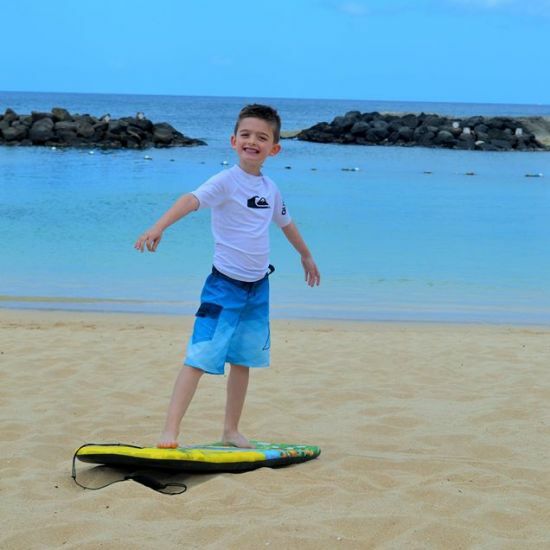 He also loves riding on his Daddy's paddleboard. Ron and I have gotten to know this family and have become very good friends since that first photo shoot. They are amazing people with big hearts and we are so thankful to have gotten to know them! 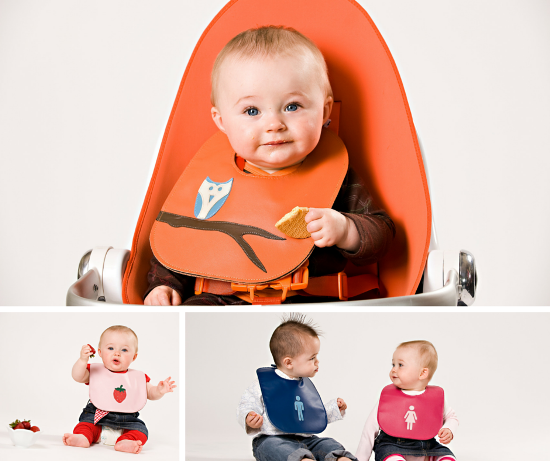 Over the years we have had some of the most adorable models for Mally Bibs! We recently sent out a message through our facebook page to find our past models to see where they are now and find out a little bit about them as part of our 10 year celebration! 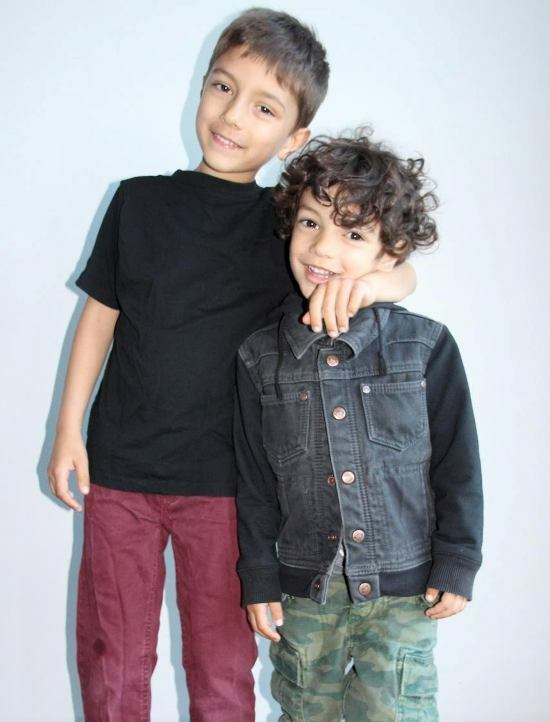 Meet Tai, our handsome model whose hairstyle was cool then and still is! Tai modeled our Tiger Bib, which has since had a refresh, and our Mod Boy Bib, which can now only be ordered through our custom bib studio under the discontinued designs tab. Approaching the wise old age of 8, Tai spends most of his free time mastering martial arts and unlocking the magic of manipulating the elements. As his arch nemesis (AKA his 4 yr old little sister) is constantly bringing him to the threshold of the "dark side" he finds inner peace in meditation. 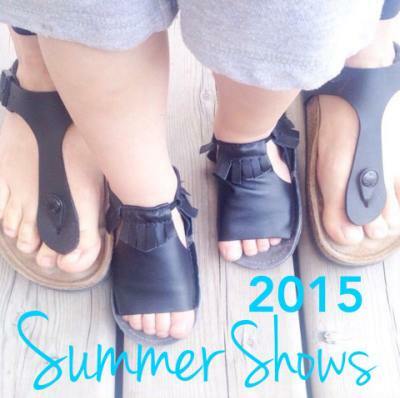 Mally Designs Summer Markets and Retail Shows Announced! You could say our Spring Shows were an epic success, so thank you to everyone who bought from us at our markets! I think what made us happiest was seeing our sandal mocs gain popularity. We are so happy that they are taking off and now that we are gearing up for the summer months, we know they will gain even more popularity! We are so pumped to have been accepted into a bunch of amazing Summer markets this year! We honestly can't wait. We plan to work hard / play hard all summer long and it all starts this weekend! Even though it's not officially summer until June 21st, we are calling this summer starting NOW! This year, we are staying within the beautiful province of BC. See how cute these Mally Mocs baby sandal moccasins are?! Photo credit goes out to our friends at Buddhi Baby who carries our sandal mocs and a beautifully curated assortment of products for Moms and babies on their own online store! Do you plan to see us at any of our upcoming summer shows? If so comment below on our blog, instagram or facebook and let us know! For complete details including hours and locations, please visit the Mally Designs Events Page here. Celebrating 10 Years with online promotions all month long! 10 years in business is a big deal, and we know we couldn't have made it to this milestone birthday without you! 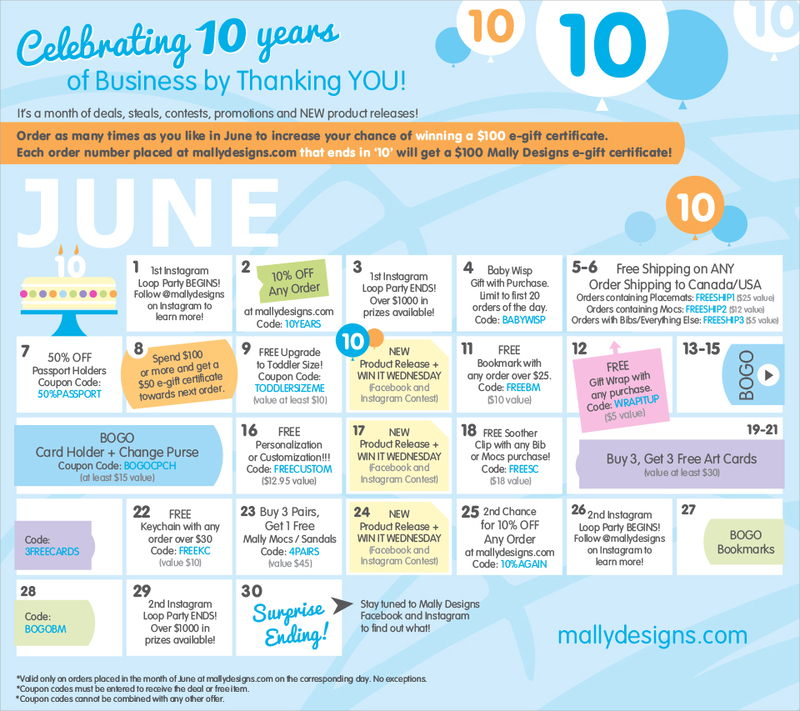 To celebrate we are throwing a month long party at mallydesigns.com with contests, deals, collaborations, gifts, product releases and more! Today we release our Birthday month calendar just for you! Each Monday throughout June, we will send our newsletter subscribers a detailed list of events and how to redeem the deals for the coming week. You'll notice at the top of the calendar that if your order number ends in 10, you will get a $100 e-gift certificate, so please take advantage of these deals as often as you like in order to increase your chances of winning this fabulous prize! THANKS for 10 YEARS and please enjoy this month long party! Help spread the word by sharing this blog post and learn even more by following Mally Designs on facebook! 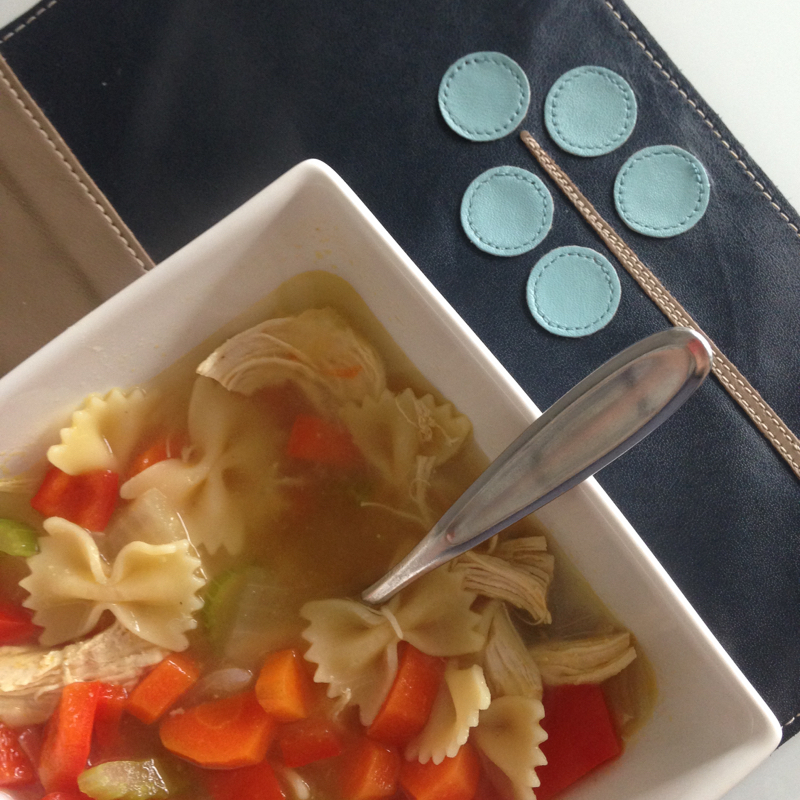 Cure for cold and flu season - the best homemade chicken noodle soup in 10 easy steps! Everyone knows that chicken noodle soup is known as one of the greatest comfort foods for cold and flu season. Every time I return from a trip it seems, I am hit with some sort of cold or flu. I'm sure it's a combination of long days, climate adjusting, not eating right while on the road, and flying home on a germ festering flight with a few hundred other people coughing and sneezing amongst circulating recycled air for 5+ hours. It's all really a bad combination. Instead of staying in bed feeling sorry for myself, I am doing everything in my power to fight this thing, because I have a life to live and kids to be present for and a business to run! Thanks to my friend Pascale for this quick and easy recipe for what is the best homemade chicken noodle soup I've had! This recipe makes about 8-10 servings. It feeds our family of 4 lunch for two days. We take the leftovers and re-heat it in our mini slow cooker the next day. Beware, you will have garlic breath after eating this, but chances are if you're sick you are sticking around home anyhow. Enjoy! NEW Pet Bibs and Mally Bibs Coupon Code! As we mentioned on facebook and instagram this morning, we have a new product that we are adding to our collection of baby mocs and bibs! 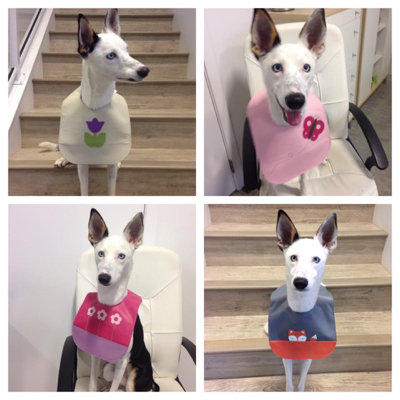 Sweet Zoe recently came to our studio to model our NEW pet bibs! They are available in 3 sizes for small, medium and large dogs. The small ones also fit cats! *coupon code will actually get you 10% off at mallydesigns.com today, April 1st only. 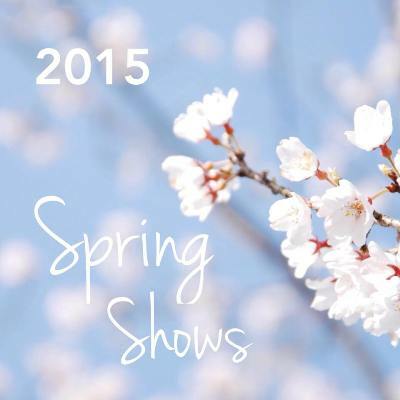 Mally Designs Spring Retails Shows! We have always loved meeting our customers in person and getting to know those wonderful regulars who buy from us year after year at our retail shows and online. It's also super fun traveling to the many great cities that our country has to offer. We always manage to fit in a little bit of fun at local hang outs with fellow vendors who have become very good friends of ours, as well as a little personal handmade shopping. Nothing is more satisfying than spending our hard earned money on other beautiful handmade items! This year, we have decided to take on a few new Spring shows to help spread the word about some of our newer products, such as Mally Mocs leather baby moccasins! Our applications went out months ago, and we are proud to say we have been accepted by all of the juried Spring shows that we had hoped! Here's our official line up of Spring retail shows, where you can find our leather bibs, baby moccasins, soother clips, art cards and our entire line of accessories... we hope to see you there at one or more of these fantastic markets! TIP: follow Mally Designs on facebook and instagram for chances to win tickets to many of these shows!